Western blot analysis of whole cell lysates probed with PRPF8 antibody followed by detection with HRP conjugated Goat anti Mouse IgG (1/10,000, STAR207P) and visualized on the ChemiDoc MP with 118second exposure. Arrow points to PRPF8 (molecular weight 252 kDa). PRPF8 antibody recognizes pre-mRNA-processing-splicing factor 8, also known as 220 kDa U5 snRNP-specific protein, apoptosis-regulated protein 1 or precursor mRNA processing protein. Mouse anti Human PRPF8 antibody recognizes pre-mRNA-processing-splicing factor 8, also known as 220 kDa U5 snRNP-specific protein, apoptosis-regulated protein 1 or precursor mRNA processing protein. Pre-mRNA splicing occurs in 2 sequential transesterification steps. The protein encoded by PRPF8 is a component of both U2- and U12-dependent spliceosomes, and found to be essential for the catalytic step II in pre-mRNA splicing process. It contains several WD repeats, which function in protein-protein interactions. This protein has a sequence similarity to yeast Prp8 protein. PRPF8 is a candidate gene for autosomal dominant retinitis pigmentosa (provided by RefSeq, Jul 2008). 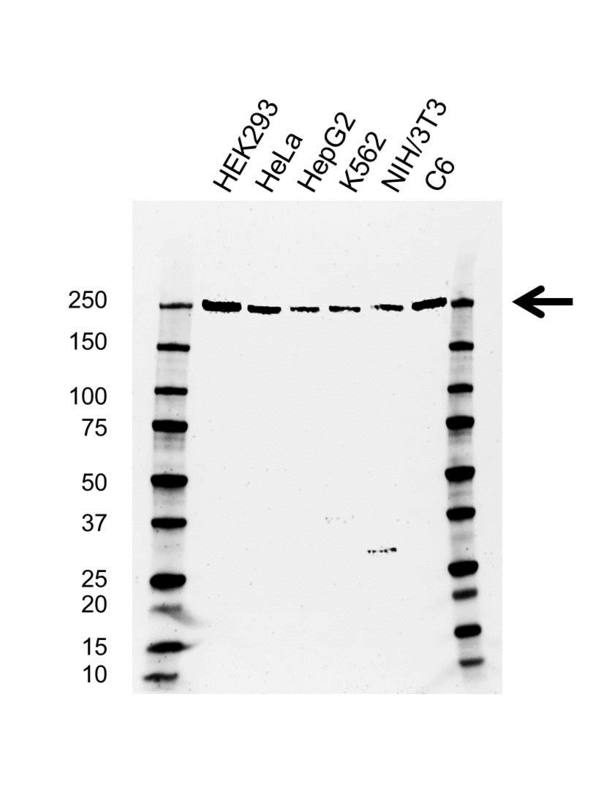 Mouse anti Human PRPF8 antibody detects a band of 252 kDa. The antibody has been extensively validated for western blotting using whole cell lysates.